This is a memorandum dated 7th August delivered to representatives from the Department for Trade and Industry, including Minister Rob Davies, ahead of a workshop in coordination with the WTO, WHO, WIPO calling on the DTI to urgently “Fix the Patent Laws” to improve South Africans’ access to medicines. You can access the original memorandum here. The Treatment Action Campaign (TAC) and Doctors Without Borders (MSF) urgently call upon the Department of Trade and Industry (DTI) to reform the system for examining pharmaceutical patent applications in South Africa, in order to ensure patients have greater access to affordable medicines. Despite widespread calls for reform to the country’s patent laws, the draft Intellectual Property policy that could outline such change has experienced considerable delays. Today, as the DTI convenes the “Intellectual Property and Public Health National Workshop” in coordination with the World Trade Organization (WTO), World Health Organization (WHO) and World Intellectual Property Organization (WIPO), we request that the DTI recognize the validity of the needed reforms outlined below, and commit to a more timely prioritisation of the IP policy. The agreement on Trade Related Aspects of Intellectual Property Rights (TRIPS) sets the standards of intellectual property protection that World Trade Organisation (WTO) member states are required to uphold at 20 years – during which period the patent holder has exclusive rights to market the medicine. This lack of a competitive market allows pharmaceutical companies to often charge unaffordable prices in order to maximise profits – meaning life-saving medicines remain inaccessible to those in need. Certain legal flexibilities within TRIPS were affirmed in 2001 in order to protect countries’ abilities to achieve the right to health. Although other BRICS countries like India and Brazil have utilised these pro-public health safeguards, South Africa is lagging behind and has not amended its patent law to incorporate or implement TRIPS flexibilities. This is highly problematic given South Africa’s high burden for both communicable and non-communicable diseases, and the continuing rise in healthcare costs. There is a pressing need to take urgent steps to address access to many important medicines which would save the lives of millions of South Africans. South Africa hands out an excessive number of pharmaceutical patents—more than most developed or developing countries—without examining patent applications to determine their validity. Whilst the introduction of an examination system is the cornerstone of patent law reform, South Africa must also ensure that at the examination stage the patents office only grants patents on new drugs and prevents abusive patenting. If fewer secondary patents are granted, then more generic versions of medicines will be able to enter the market upon the expiry of compound patents, which will in turn drive down prices. Furthermore, when patents result in medicines being priced out of reach, actions that mitigate high prices, such as compulsory licensing, must be practically feasible to implement. We call on the DTI to limit the number of pharmaceutical patents granted in South Africa by (1) ensuring that all pharmaceutical patent applications are substantively examined; (2) by strengthening patentability criteria to prevent patent evergreening; (3) by enhancing public transparency of the Patents Office concerning pending patent applications and the status of granted patents; (4) by allowing a broad range of third parties to file pre-grant and post-grant patent oppositions; (5) and by broadening the grounds and facilitating the procedures for issuing a compulsory license. South Africa does not examine patent applications to determine whether they meet the country’s standards of patentability – because of this South Africa grants an excessive number of patents when compared to countries that do examine applications. In 2008 alone South Africa granted 2,442 pharmaceutical patents, while by contrast, Brazil only granted 278 pharmaceutical patents between 2003 and 2008. Prices are kept artificially high because pharmaceutical companies are able to obtain multiple patents on the same medicine, – a process known as ‘evergreening’. For example, in South Africa to treat a cancer patient for a year with Novartis’ drug imatinib costs over R387,000—one of the highest prices in the world. Even though Novartis’ 20-year patent on the compound imatinib expired in South Africa in April 2013, an additional patent for a ‘new use’ of imatinib does not expire until 2022. This additional patent delayed generic manufacturer Cipla from introducing a product onto the market. On the expiry of the first patent, Cipla was forced to initiate litigation procedures against Novartis to clarify whether its generic product infringed the new use patent. However, eventually the two companies settled the matter out of court under confidential terms. The Cipla product is now available in South Africa at a 46% price reduction compared to Novartis’ imatinib. Yet Novartis’ patent remains enforceable in South Africa, which means that other generic manufacturers of the same cancer drug could face similar constraints in introducing more affordable versions of imatinib. Section 34 of the South African Patents Act requires that all patent applications are examined to ensure that they meet the legal requirements of patentability, but to date, the DTI has failed to take the necessary steps to ensure patent applications are substantively examined in South Africa. This critical shortcoming must be addressed. The TRIPS agreement requires countries to grant patents on all products that are ‘new’, ‘involve an inventive step’ and are ‘capable of industrial application’. Through strict patentability criteria outlined in Section 3(d) of the Indian Patents Act, India has avoided granting excessive monopolies for secondary use, combinations or new formulations of medicines. The recent Supreme Court decision in India defended the validity of Section 3(d) by denying Novartis’ appeal for a patent on a new form of imatinib. The absence of a patent on imatinib in India has created a competitive market where the drug rapidly became available for 94% less than the originator equivalent, now at an affordable R170 (US $17) per month. South Africa does not explicitly exclude new forms, new uses and new formulations of already existing medicines from patentability. South Africa must curtail this abusive practise by interpreting TRIPS in a pro-public health manner to prevent evergreening. This requires a change to the patentability criteria in existing patent law. In addition to granting patents without examination, the Patents Act does not contain provisions for pre- or post-grant opposition of patents by a third party. 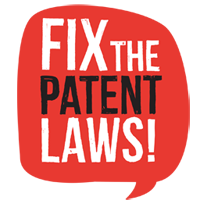 The only way to challenge a patent in South Africa is through lengthy and expensive court proceedings. By contrast, India provides for pre- and post- grant opposition under its national legislation. In India a third party (including generic manufacturers, researchers, civil society organisations, and other interested persons and entities) can oppose a patent while the application is pending, and for one year after it is granted. This is done by submitting evidence to the patents office detailing why the patent should not be granted. Such a system makes challenging patents less burdensome and allows the patent office to benefit from the inputs of various stake holders. Opposition procedures must be coupled with proper disclosure requirements as currently there is inadequate transparency around pending applications and their examination. For instance, in India and Argentina patent applications must be published and first examination reports be made available in the public domain before a decision is made. In Brazil it is required that a health authority is informed of all pending applications that may adversely impact on health. The South African Patents Act should also be amended to ensure disclosure of pending patent applications including the international non-proprietary (generic) name in the abstract. Most importantly patent claims, priority data, pending status, prosecution history, and patent decisions must be available on the patent office website to facilitate third party searches. South Africa also has the flexibility under the TRIPS agreement to issue compulsory licenses in cases where medicines remain inaccessible, due to high cost or inadequate supply. A compulsory license allows for more affordable generic production of an expensive medicine, with a royalty fee paid to the patent-holder as compensation. Even though the Patents Act already provides for compulsory licenses, these provisions have not been used on a pharmaceutical product – in part due to sub-optimal terms and procedures. According to a report from UNDP, in South Africa it may cost up to R1,000,000 and take over three years to undergo court procedures to issue a compulsory license. South Africa could for instance issue a compulsory license to attain an affordable version of linezolid, a high-strength antibiotic used to treat extensively drug resistant tuberculosis (XDR-TB). Despite growing rates of XDR-TB in South Africa, access to the drug is limited due to prohibitively high prices. Pfizer is the sole supplier of linezolid in South Africa and charges R287 ($28) per 600mg tablet in the public sector, while MSF pays R676 ($67) per tablet through the private sector. With XDR-TB patients requiring one linezolid tablet a day, this amounts to over R123,000 ($12,300) per patient for a six-month supply of linezolid, which is only part of a regimen containing multiple drugs. In comparison a generic version of linezolid is available from an Indian producer for R25 per tablet, but Pfizer’s patents currently block access. Streamlining the process for issuing a compulsory license in South Africa could have a dramatic impact on medicine prices for linezolid and other critical medicines. The Department for Trade and Industry (DTI) has promised reform of the country’s patent laws in the form of a new intellectual property (IP) policy. 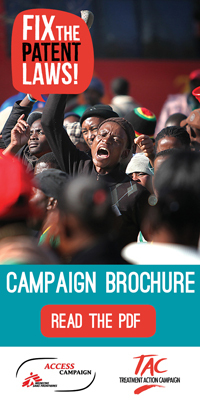 The release of this draft policy has experienced multiple, unexplained delays, yet Section 27 of the Bill of Rights in the South African constitution places a legal obligation upon the government to ensure the progressive realisation of the right to health care services, including addressing the barriers to access such as the current patent system. South Africans should no longer accept complacency from the government in dealing with this problem. As organisations committed to public health, we urge the DTI to fulfil its promises and release its draft IP policy for widespread, transparent consultation, incorporating our recommendations outlined above.